Very easy to make, looks fantastic and shhhh…….don’t tell anyone its meaty (hearty) yet 100% vegetarian dip. And of course it’s a good change if you are tired of serving same old salsa and chips which I am and hence exploring different companion for my chips to serve at next gathering. The process is similar to making one of the Indian dishes, Baigan (Eggplant) bharta (Roasted), with slight different flavor combination. Addition of capers and lemon gives nice tang to this dish. 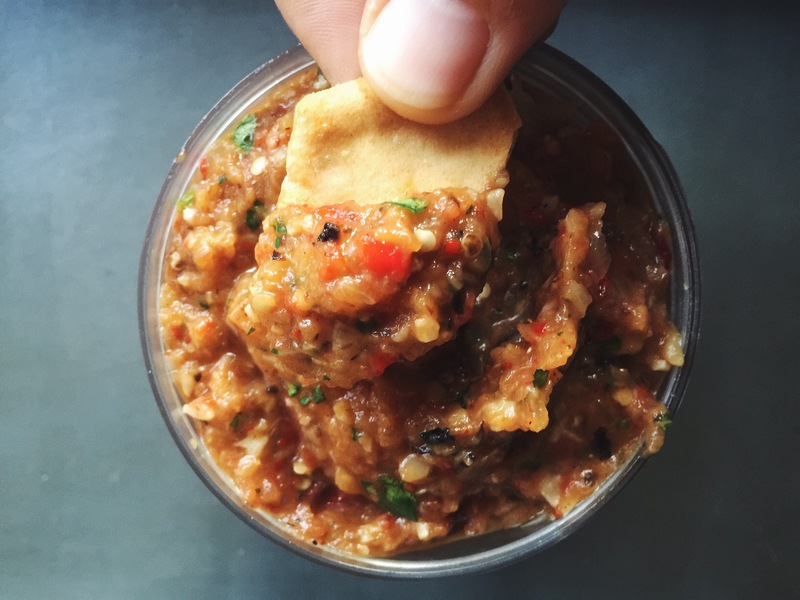 If you love eggplants like I do this dip is for you. Once you have it ready you can go creative and use it to make or enhance lot of different dishes from breakfast to dinner. I had it with fried egg and toast over the weekend & used it today to make bite size meal for quick Monday lunch. Check out this instagram link to find out what I am talking about. The next thing I want to do is use it as topping for my salad and than to jazz up white potato roasted onion soup….yup..the list endless. But you got my point, this can be next sriracha or harissa for me, wink and smile. * Fresh tomato tends to make dip watery; hence I used canned tomatoes in this recipe. Cut onions in to about an inch cubes and set aside. Remove the knot part at head of garlic so that once cooked the cloves can slip right out. Cut eggplant length wise in 4 pieces so once roasted skin can be removed easily. Cut red pepper and transfer all the veggies to the baking tray. 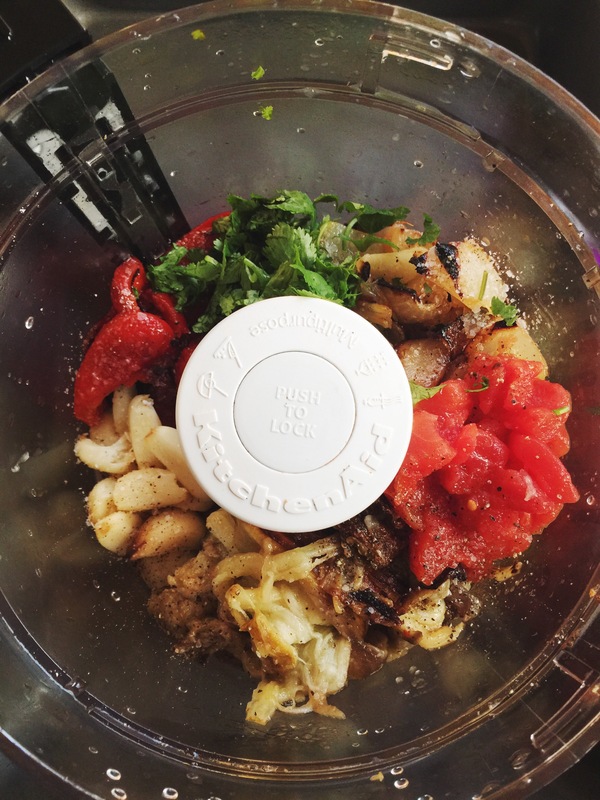 Drizzle veggies generously with extra virgin olive oil and sea salt. 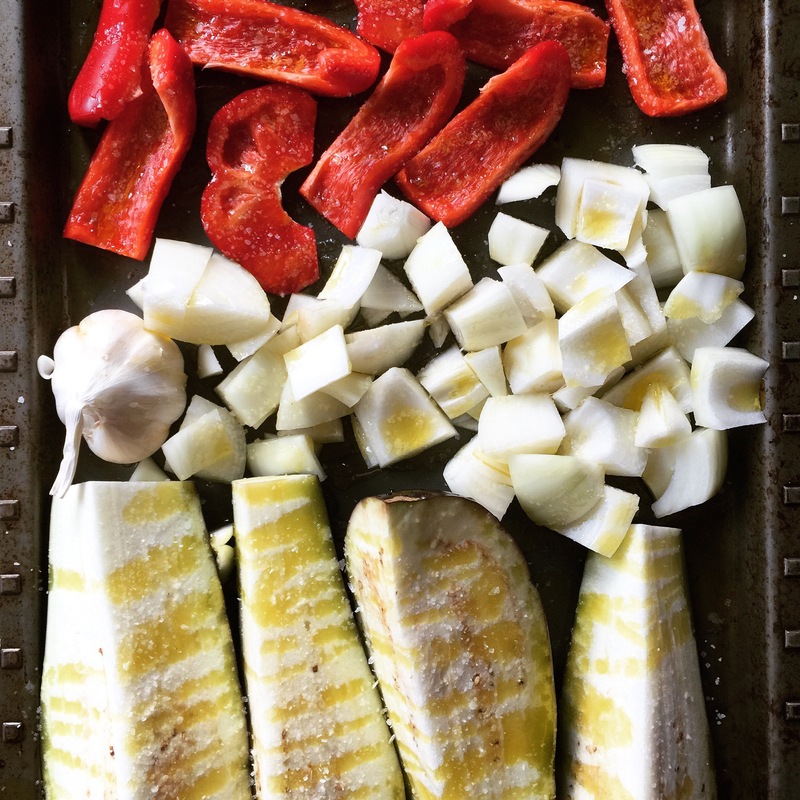 Roast veggies for total 30-45 min or until roasted and cooked through. Toss them around after 20 minutes to make sure they roast evenly. Once cooked through let it cool for few minutes before handling. 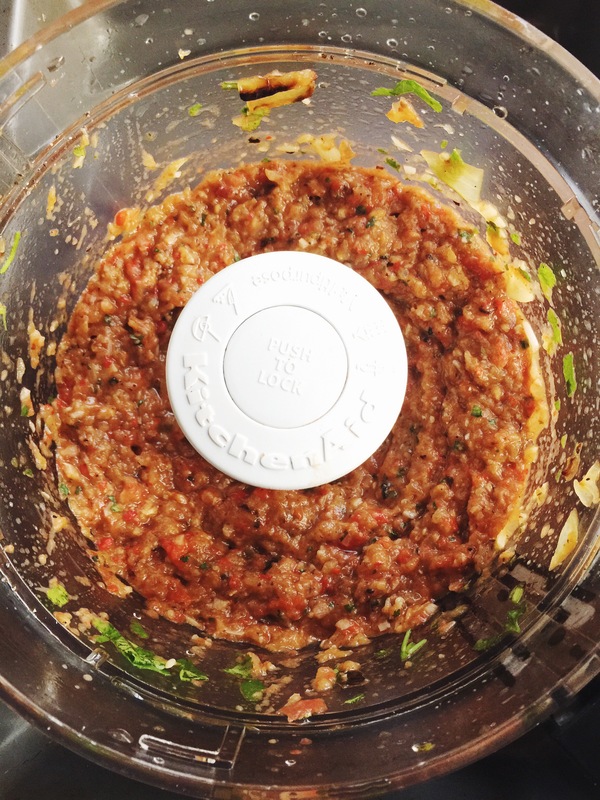 Remove skin from garlic, red pepper and eggplant and put everything in food processor along with salt and pepper, lemon juice, cilantro, tomato and capers. Pulse a few times until till everything is just combined. Don’t purée. Serve with chips of your choice, warm pita wedge or naan.